Change the World Books, 9780997692112, 246pp. "Tree" is a novel about a tree written from a unique point of view: the chief narrator is a tree. 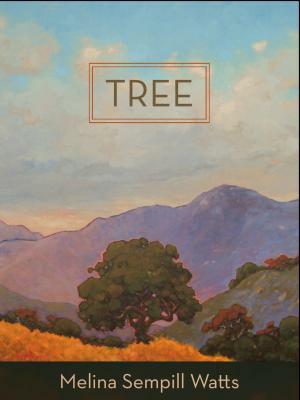 "Tree" uses magical realism as a key to access the interrelated emotional realities of the many species that share one pristine valley in Topanga, California. Grass, birds, other trees and animals come to life on the pages, while one 19th century Mexican woman and one 20th century school boy, hearts opened by grief and loneliness, come to know one California live oak whose 229 years span the evolution of four human civilizations, Chumash, Spanish/Mexican, Yankee and new money Hollywood, which each leave their mark upon the landscape and upon "Tree." The author's obsessive botanical, scientific and historical research give substance to a world that feels both as real as last weekend's dust on hiking boots and as mind altering as a fully fledged mystical experience. You'll never see Mexican spranglegrass the same way again. Take a journey into the heart of the woods where every plant shines. "Tree" will change how you see nature. Melina Sempill Watts' writing has appeared in "Sierra Magazine," the "New York Times" motherlode blog, "Earth Island Journal" and "Sunset Magazine," in local environmental venues such as "Urban Coast: Journal of the Center for the Study of the Santa Monica Bay," the Heal the Bay blog and in local papers such as "Malibu Times," "Malibu Surfside News," "VC Reporter," "Topanga Messenger" and "Argonaut News." She appeared on a panel at the L.A. Times Book Festival in April 2017. Watts began her career in Hollywood as a development executive, writing consultant and story analyst working for such luminaries Frank Marshall, Kathleen Kennedy and Peter Horton and at Dreamworks. She has worked as a watershed coordinator, run a stable, shelved books at a library and created, marketed and ran Starfish Catering. Watts graduated from UCLA with a degree in history. She lives in California.